Accumulating evidence indicates that the cognitive effects of dopamine depend on the subtype of dopamine receptor that is activated. In particular, recent work with animals as well as current theorizing has suggested that cognitive flexibility depends on dopamine D2 receptor signaling. However, there is no evidence for similar mechanisms in humans. We aim to demonstrate that optimal dopamine D2 receptor signaling is critical for human cognitive flexibility. To this end, a pharmacological pretreatment design was employed. This enabled us to investigate whether effects of the dopamine receptor agonist bromocriptine on task-set switching were abolished by pretreatment with the D2 receptor antagonist sulpiride. To account for individual (genetic) differences in baseline levels of dopamine, we made use of a common variable number of tandem repeat (VNTR) polymorphism in the 3′-untranslated region of the dopamine transporter gene, DAT1. Bromocriptine improved cognitive flexibility relative to placebo, but only in subjects with genetically determined low levels of dopamine (n = 27). This beneficial effect of bromocriptine on cognitive flexibility was blocked by pretreatment with the selective dopamine D2 receptor antagonist sulpiride (n = 14). These results provide strong evidence in favor of the hypothesis that human cognitive flexibility implicates dopamine D2 receptor signaling. Mieke van Holstein and Esther Aarts contributed equally to this work. The online version of this article (doi: 10.1007/s00213-011-2340-2) contains supplementary material, which is available to authorized users. Adequate adaptation to our environment requires a range of behavioral control processes, such as reinforcement learning, incentive motivation, working memory, and set switching. Brain dopamine has been most commonly implicated in working memory (Cools 1980; Lyon and Robbins 1975; Oades 1985) and in reward-related processes, including reinforcement learning and incentive motivation (Baldo and Kelley 2007; Berridge and Robinson 1998; Daw et al. 2005; Schultz 2002). However, there is considerable evidence that dopamine is also critical for other control processes, such as set switching. This evidence comes mainly from work with experimental animals (Cools 1980; Floresco et al. 2006; Haluk and Floresco 2009; for a review, see Floresco and Magyar 2006; Oades 1985; Redgrave et al. 1999), drug administration and candidate gene studies in healthy volunteers (Cools et al. 2007b; Mehta et al. 1999; Stelzel et al. 2010) as well as medication withdrawal studies in patients with Parkinson’s disease (Cools et al. 2001a, b, 2003). Accumulating evidence indicates that these cognitive effects of dopamine depend on the subtype of dopamine receptor that is activated (Frank and Fossella 2011; Frank and O’Reilly 2006; Seamans and Yang 2004). In particular, recent in vivo work with animals (Floresco and Jentsch 2011; Floresco et al. 2006) as well as in vitro and theoretical work (Bilder et al. 2004; Durstewitz and Seamans 2008) implicates the dopamine D2 receptor family in set switching. For example, in rodents, blockade of dopamine D2 receptors in the prefrontal cortex (PFC) impaired set shifting, while leaving unaltered performance on working memory tasks (Floresco et al. 2006). According to the dual-state theory put forward recently by Durstewitz and Seamans (2008) and Seamans and Yang (2004), PFC networks can be either in a D1-dominated state, which is characterized by a high energy barrier favoring robust stabilization of representations, or in a D2-dominated state, which is characterized by a low energy barrier favoring fast flexible switching between representations. Consistent with this proposal are findings that dopamine D2 receptor agonists act in opposite ways to dopamine D1 receptor agonists, at least in vitro, on NDMA and GABA currents, neuronal excitability as well as on cyclic AMP production (Durstewitz and Seamans 2008) with dopamine D2 receptor stimulation inducing reduction in NMDA currents and GABAergic inhibition. The hypothesis that dopamine D2 receptor stimulation is important for set switching is corroborated by findings in humans that the dopamine D2 receptor antagonist sulpiride impaired performance on task-set switching (Mehta et al. 2004). However, according to current standards in animal pharmacology (Feldman et al. 1997), more direct claims about the receptor mechanisms of drug effects can be made based only on the observation that the action of a receptor agonist is blocked by pretreatment with a receptor antagonist, an approach that has been rarely adopted in human research. Here, we provide stronger evidence for a role of dopamine D2 receptor action in cognitive flexibility by adopting such a pretreatment design in young healthy volunteers. Specifically, we demonstrate that an effect of the dopamine receptor agonist bromocriptine on cognitive flexibility was abolished by pretreatment with the dopamine D2 receptor antagonist sulpiride. Cognitive flexibility was assessed using the task-set switching paradigm (Rogers and Monsell 1995). Unlike traditional measures of cognitive flexibility, such as the Wisconsin Card Sorting Test (Grant and Berg 1948) or indeed any other set switching paradigm with a rule learning component, this paradigm minimizes demands for learning and working memory. It requires the ability to switch rapidly, based on external cues, between already well-established task sets (stimulus-response mappings). Adequate performance does not depend on feedback or trial-and-error learning, and the acquisition of task sets is a rapid learning process, where the formation of associations between stimuli (i.e., the word “left”) and responses (i.e., a left button press) does not require extensive training. After the acquisition of task sets in practice blocks, switches can be rapidly performed and measured under time pressure. Moreover, task-set switches are externally cued, which reduces the load on working memory. Therefore, the task-set switching paradigm is relatively specific for measuring set switching. One challenge to dopaminergic drug research is that there is large variability across different individuals, with only some people benefiting from the drug, thus obviating an effect across the population as a whole (Cools and D’Esposito 2011; Cools and Robbins 2004). We know that at least some of this variability reflects variation in baseline levels of dopamine (Cohen et al. 2007; Cools et al. 2009; Mattay et al. 2003). For example, high-impulsive subjects (who likely exhibit low baseline dopamine function (Buckholtz et al. 2010; Dalley et al. 2007)) are more sensitive to the beneficial effect of dopaminergic drugs on set switching and reversal learning than are low-impulsive subjects (Cools et al. 2007b). Moreover, dopaminergic drugs like bromocriptine, amphetamine, and methylphenidate have diametrically opposite, beneficial, and detrimental effects in subjects with low and high working memory capacity, respectively (e.g. Mattay et al. 2000). The hypothesis that this individual variability reflects variation in baseline levels of dopamine was strengthened by three recent observations. First, working memory capacity correlates positively with dopamine synthesis capacity in the striatum, as measured with neurochemical positron emission tomography (Cools et al. 2008). Second, dopaminergic drug administration was shown to have opposite effects in individuals with high- and low-dopamine synthesis capacity (Cools et al. 2009). Finally, dopaminergic drug administration was shown to have opposite effects as a function of individual genetic variation in dopamine transmission (Cohen et al. 2007; Mattay et al. 2003). Based on these observations, we predicted that the dopamine receptor agonist bromocriptine would improve set switching, but only in those individuals with low baseline levels of dopamine. One way to assess differences in baseline levels of dopamine is by taking into account individual genetic differences. For example, using the same task-set switching paradigm, we previously showed that performance and task-related striatal BOLD responses depended on individual variability in the dopamine transporter (DAT) gene, which has been associated with differences in gene expression in the striatum (Fuke et al. 2001; e.g., Heinz et al. 2000; Mill et al. 2002; VanNess et al. 2005; but see van Dyck et al. 2005). Moreover, these effects were independent of the catechol-O-methyltransferase gene (Aarts et al. 2010), which codes for the enzyme that degrades DA primarily in the PFC. Therefore, we took into account individual differences in baseline dopamine function by making use of a common VNTR polymorphism in the 3′-untranslated region of the DAT gene (DAT1/SLC6A3). We anticipated that subjects with genetically determined lower levels of dopamine as measured with the DAT1 genotype would show the greatest effect of bromocriptine on set switching. Finally, we predicted that an effect of bromocriptine would be blocked by pretreatment with the selective dopamine D2 receptor antagonist sulpiride. Fifty-five subjects were recruited through advertisements on the campus. DAT1 genotype was available for 49 subjects, and one subject was excluded because of an ADHD diagnosis. The resulting 48 subjects were right-handed, speaking Dutch fluently and European Caucasians (24 males and 24 females, mean age 21.58 years, range 18–27). They were compensated for participation and gave written informed consent in a manner approved by the local ethics committee on research involving human subjects. All subjects were screened before inclusion by a medical doctor and a research nurse; this included the Mini-International Neuropsychiatric Interview (Sheehan et al. 1998) and a physical examination for weight, heart rate, blood pressure, and an electrocardiogram, to exclude major psychiatric, neurological, or medical illness including substance abuse at the time of testing. One subject had a history of anorexia nervosa but was treated successfully 3 years prior to this study and was therefore not excluded. Subjects were asked to abstain from alcohol and nicotine 24 h before testing and from caffeine on the day of testing. All subjects consumed a light breakfast before ingestion of the drugs. At the start of each session, subjects were asked about their current medical status and their compliance with the above mentioned restrictions. Subjects performed a pre-cued task-set switching paradigm (Fig. 1) with a reward manipulation. The task is described extensively elsewhere (Aarts et al. 2010). Subjects had to respond to incongruent arrow–word combinations, either by responding to the direction of the arrow or the direction indicated by the word (“left” or “right”). As in previous work (Aarts et al. 2010), we included only incongruent trials because the switch cost is largest in the presence of response conflict, which is evoked more by incongruent than congruent targets (Aarts et al. 2009). Before each trial, a task cue appeared indicating according to which task (arrow or word) the subject had to respond. Compared with the previous trial, the task either changed unpredictably (from arrow to word or vice versa; switch trial), or remained the same (repeat trial). The critical measure of interest, the switch cost, was calculated by subtracting performance [error rate (percent) and response time (milliseconds)] on repeat trials from that on switch trials. Given our prior observation that effects of individual variability in striatal dopamine on set switching are potentiated under conditions of high incentive motivation (Aarts et al. 2010; see also Baldo and Kelley 2007), we also manipulated reward anticipation by presenting high and low reward cues prior to the task cue. The reward cue informed the subjects whether 1 cent (low reward) or 10 cents (high reward) could be earned with a correct and quick response. Immediately following the response, feedback was given (e.g., “correct! 10 cents”). There was a variable interval between the reward cue and the task cue of 1 to 2 s. Subjects responded with their index fingers on a left or right button box. The main experiment consisted of 160 trials and lasted ∼30 min with a 30-s break after every 32 trials. In the break, the amount of money the subject earned thus far was displayed on the screen, and subjects were told in advance the total amount would be added to their financial compensation as a bonus. All 48 subjects were tested at least twice: once after an oral dose of the dopamine receptor agonist bromocriptine (Parlodel ®, Novartis; 1.25 mg) and once after a placebo. In addition, a subgroup (n = 14) received placebo or bromocriptine after pretreatment with placebo or the dopamine D2 receptor antagonist sulpiride (Dogmatil ®, Sanofi-Aventis; 400 mg) on two other occasions. The order of administration of the two or four sessions was randomized according to a double-blind, placebo-controlled crossover design. The sessions were always separated by at least 1 week. The doses described here have been used before in similar psychopharmacological studies and have been shown to be well tolerated by subjects (Cools et al. 2007b; Mehta et al. 2004). Sulpiride or placebo was administered 30 min prior to bromocriptine or placebo. The task was performed ∼4 h after sulpiride or placebo intake and ∼3.5 h after bromocriptine or placebo intake. Time of dosing was optimized for detecting drug effects during functional magnetic resonance imaging (fMRI) that took place immediately prior to the experiment reported here (data to be published elsewhere). The timing of the fMRI sessions was based on prior studies showing behavioral effects at similar doses and at similar time points in healthy volunteers (Cools et al. 2007b; Gibbs and D’Esposito 2005a, b; Kimberg et al. 1997; Luciana and Collins 1997; Luciana et al. 1992; Mehta et al. 2003, 2004, 2008, 2001). Mean time to maximal plasma concentration of sulpiride is about 3 h, with a plasma half-life of about 12 h (Mehta et al. 2003), while mean time to maximal plasma concentration of bromocriptine is about 2.5 h with a plasma half-life of about 7 h (Deleu et al. 2002). The combination of plasma kinetics and physiological effects shows that the time of testing coincided with high plasma concentrations of both bromocriptine and sulpiride (Supplementary results: Table S1). A session started either at 8:00, 8:30, or 10:30 AM, and starting time was kept identical between each subject’s two or four sessions. Blood pressure, heart rate, mood measures [visual analog scales; 16 ratings on a scale of 0–100 (Bond and Lader 1974)] and blood samples (6 ml) were taken immediately after arrival of the subject and on average 73.1 (SD 45.4) min before the task was performed. Blood samples were used to determine the change in prolactin levels due to dopamine D2 receptor binding (Fitzgerald and Dinan 2008; Supplementary material and methods). On the day of screening, subjects completed a number of questionnaires, including the Beck Depression Inventory (BDI; Beck et al. 1961), Barratt Impulsiveness Scale (BIS-11; Patton et al. 1995), State–Trait Anxiety Inventory (STAI; Spielberger et al. 1970), and Listening span (Salthouse et al. 1991; Supplementary material and methods). Verbal IQ was determined using Dutch Adult Reading Test, the Dutch version of the National Adult Reading Test (Schmand et al. 1991). All molecular genetic analyses were carried out in a CCKL-certified laboratory at the department of Human Genetics of the Radboud University Nijmegen Medical Centre. DNA was isolated from saliva samples using Oragene kits (DNA Genotek Inc, Ottawa, ON, Canada). Genotyping of the 40-bp VNTR polymorphism in the 3′ untranslated region of the SLC6A3/DAT1 gene encoding the DAT was performed as follows: Genomic DNA (100 ng) was amplified with 0.2 μM fluorescently labeled forward primer (5′-Ned-TGTGGTGTAGGGACGGCCTGAGAG-3′) and 0.2 μM reverse primer (5′-CTTCCTGGAGGTCACGGCTCAAGG-3′) with PIG tail, 0.25 mM dNTPs, 0.4 U AmpliTaq Gold DNA polymerase (Applied Biosystems, Nieuwerkerk a/d IJssel, the Netherlands) in an PCR Optimized buffer D (Invitrogen, Breda, the Netherlands), containing 10% DMSO (v/v). Cycling conditions were 12 min 95°C followed by 35 cycles of 1 min 94°C, 1 min 58°C, and 1 min 72°C and a final 5 min at 72°C. PCR products were diluted 10 times, and 1 μl of the diluted PCR product together with 9.7 μl formamide and 0.3 μl GeneScan-600 Liz Size StandardTM (Applied Biosystems) was analyzed on a 3730 Genetic Analyzer (Applied Biosystems) according to the protocol of the manufacturer. Analysis of the length of the PCR products was performed with Genemapper software. To investigate the random genotyping error rate, the lab included 5% duplicate DNA samples, which had to be 100% consistent. In addition, 4% blanks were included, which were required to be negative. Most of the participants (except three) took part in the study before their genotype was determined. After participation, three groups of genotypes were established: a group homozygous for the common 10-repeat allele (10R/10R; n = 27, mean age 21.7 ± 2.2, 12 females), a group homozygous for the nine-repeat allele (9R/9R; n = 7), and a group of 9R/10R heterozygotes (n = 14). The 9R/9R and 9R/10R subjects were combined into one group of 9R carriers (n = 21, mean age 21.4 ± 1.9, 12 females). Three 10R homozygotes of this sample were selected from an existing genetic database at the center. Of the subgroup of participants who received four instead of two drug sessions, we only included data from the 10R homozygotes (n = 14; mean age 21.9 ± 2.4, six females) because these were the participants showing an effect of bromocriptine in the larger sample. The DAT removes dopamine from the synapse into the presynaptic neuron (Willeit and Praschak-Rieder 2010), thereby terminating its action. The 10-repeat allele has been associated with increased gene expression and presumably lower levels of synaptic dopamine in the striatum relative to the nine-repeat allele (Fuke et al. 2001; e.g., Heinz et al. 2000; Mill et al. 2002; VanNess et al. 2005; but see van Dyck et al. 2005). The mean latencies of the correct responses and the proportion of errors were analyzed using a repeated-measures general linear model with the within-subjects factors Reward, Switching, and Drug and the between-subjects factor DAT1 genotype group. A similar ANOVA with Order (of drug administration: the order of bromocriptine and placebo in the large sample, or the order of all four drug sessions in the subgroup) as a covariate of no interest revealed no relevant interaction effects with Order (i.e., Order × Drug × Switching: F(1, 25) < 1; F(1, 12) < 1) for any of the reported Drug × Switching interactions. Accordingly, the ANOVA was run without this additional factor. Effects of sulpiride (pre)treatment were assessed for the group that showed an effect of bromocriptine (i.e., the 10R homozygotes). The first trial of each block was eliminated from analyses as they were neither switch nor repeat trials (five trials per subject). To investigate whether drug effects reflected a form of learning rather than set switching, we also assessed learning curves for each subject, i.e., switch costs as a function of time (Supplementary results: learning effect). This supplementary analysis revealed that the drug effects did not vary as a function of time. Prolactin and mood ratings (three factors: contentedness, alertness, and calmness, according to Bond and Lader (1974)) were available for 46 subjects. For each session, we calculated the drug-induced change in prolactin and mood ratings (after–before drug intake) and compared this with the placebo-induced change [difference score = (drug session (Time2 − Time1)) − (placebo session (Time2 − Time1))]. Pearson correlations were calculated, in the 10R homozygotes, between trait anxiety (STAI), trait impulsivity (BIS-11), depression (BDI), listening span scores, bromocriptine-induced mood changes, bromocriptine-induced prolactin changes, and bromocriptine-induced changes in set switching. All 48 subjects performed the pre-cued task-set switching paradigm after receiving a placebo or the dopamine receptor agonist bromocriptine (1.25 mg). Under placebo, there was no difference in terms of set switching between the DAT1 genotype groups [error rates; Switching × DAT1: F(1, 46) < 1]. However, consistent with our prediction, bromocriptine improved set switching: The proportion of errors on switch trials relative to repeat trials (i.e., the error switch cost) was reduced after bromocriptine relative to placebo in subjects with genetically determined low striatal dopamine levels (i.e., the DAT1 10R homozygotes; n = 27) [Drug × Switching: F(1, 26) = 5.4, p = 0.028]. This effect was driven by a combination of improvement on switch trials and impairment on repeat trials (Supplementary results: Table S2b). By contrast, there was no effect of bromocriptine on set switching in the DAT1 9R carriers (n = 21), who presumably have higher levels of striatal dopamine [Drug × Switching: F(1, 20) < 1] (Fig. 2; Supplementary results: Table S2a) [Drug × Switching × DAT1: F(1, 46) = 1.8, p > 0.1]. None of these effects were found in terms of response times (all p > 0.2; Supplementary results: Table S2a; S2b; Supplementary discussion). To investigate whether the beneficial effect of bromocriptine on set switching in the 10R homozygotes was mediated by stimulation of dopamine D2 receptors, we assessed the effect of bromocriptine after blocking the dopamine D2 receptors with sulpiride (400 mg) in a subgroup of the 10R homozygotes (n = 14). First we tested whether the reduced switch cost after bromocriptine administration was still present in this smaller group. Again, we found that bromocriptine reduced the error switch cost relative to placebo [Drug × Switching: F(1, 13) = 5.6, p = 0.034], an effect that again reflected a combination of improved switching and impaired repeat performance (Supplementary results: Table S2c). As anticipated, blocking the dopamine D2 receptors by pretreatment with sulpiride abolished the effect of bromocriptine relative to placebo [Drug × Switching: F(1, 13) < 1]. Sulpiride by itself, relative to placebo, had no effect on set switching [F(1, 13) < 1] (Fig. 3; Supplementary results: Table S2c and Fig. S2) [Bromocriptine (on/off) × Sulpiride (on/off) × Switching: F(1, 13) = 3, p = 0.1]. None of these effects was present in the response times (all p > 0.3; Supplementary results: Table S2c; Supplementary discussion). Our previous study (Aarts et al. 2010) revealed beneficial effects of incentive motivation on set switching. Specifically, switch costs were reduced when subjects anticipated high reward, relative to when they anticipated low reward. However, this effect was restricted to subjects with genetically determined high levels of striatal dopamine (i.e., the 9R carriers). Here we replicate this effect in an independent sample: irrespective of drug, set switching varied as a function of anticipated reward and DAT1 genotype. The 9R carriers showed a larger response time benefit of anticipated reward on switching than did the 10R homozygotes (Supplementary results: Fig. S1 and Supplementary discussion) [Reward × Switching × DAT1: F(1, 46) = 5.3, p = 0.026]. However, contrary to our expectations, we observed no difference in terms of this effect between the bromocriptine and placebo session [Reward × Switching × DAT1 × Drug: F(1, 46) = 1.5, p > 0.1] [Reward × Switching × Drug: F(1, 46) < 1]. The degree to which reward affected performance irrespective of set switching [main effect Reward: response time: F(1, 46) = 19.4, p < 0.001; error rate: F(1, 46) = 20.6, p < 0.001] was also not modulated by bromocriptine [error rate and response time: Reward × Drug: F(1, 46) < 1] [Reward × Drug × DAT1: F(1, 46) = 1.6, p > 0.2]. There were no differences between the two DAT1 genotype groups in term of age, gender, IQ, trait impulsivity (BIS-11), depression (BDI), trait anxiety (STAI), or working memory capacity (listening span; all p > 0.2; Supplementary results: Table S3a), and there were no significant correlations between any of these trait measures and drug-induced changes in performance (all p > 0.2). Working memory capacity (measured with listening span (Daneman and Carpenter 1980; Salthouse et al. 1991)) has been associated with striatal dopamine synthesis capacity (Cools et al. 2008). Moreover, previous studies have shown that dopaminergic drug effects can be predicted from working memory capacity (Cools et al. 2007b; Frank and O’Reilly 2006; Gibbs and D’Esposito 2005b; Kimberg et al. 1997). Accordingly, we assessed drug effects as a function of listening span. To this end, we divided the group into low-span participants (n = 23) and high-span participants (n = 25), using a median-split analysis (Supplemental Table S3b). Consistent with prior work and like the 10R DAT1 genotype group, the low-span group was sensitive to the beneficial effects of bromocriptine on set switching [Drug × Switching: F(1, 22) = 4.457, p = 0.046]. Conversely, the high-span group was not sensitive to the effect of bromocriptine [Drug × Switching: F(1, 24) < 1], similar to the DAT1 9R group [Drug × Switching × Span: F(1, 46) = 1.2, p > 0.2]. Moreover, in the subgroup of low-span participants that took part in all four drug sessions, bromocriptine also reduced the switch cost [Drug × Switching F(1, 9) = 5.466, p = 0.044], an effect that was not present after pretreatment with sulpiride [Drug × Switching: F(1, 9) < 1] nor after sulpiride alone [F(1, 9) = 1.1, p = 0.33]. Participants reported no drug-induced changes in mood in the large sample (all p > 0.3) or in the subgroup (all p > 0.05). There were also no significant correlations between drug-induced changes in task performance and drug-induced changes in mood (all p > 0.3). Furthermore, bromocriptine decreased plasma prolactin levels relative to placebo, whereas sulpiride increased plasma prolactin levels relative to placebo (Supplementary results: Table S1). These data evidence the opposite effects of the two drugs in vivo. The finding that the prolactin response was not nullified in the combined sulpiride and bromocriptine session (sulpiride versus sulpiride and bromocriptine t(21) = −0.279) likely reflects the fact that sulpiride was administered prior to bromocriptine. The effect of sulpiride was disproportionately large, thus masking any subsequent effect of bromocriptine. The present results show that the dopamine receptor agonist bromocriptine improved set switching by stimulating dopamine D2 receptors. Specifically, bromocriptine reduced the error switch cost in individuals with genetically determined low dopamine levels, and this beneficial effect of bromocriptine on set switching was abolished by pretreatment with the selective dopamine D2 receptor antagonist sulpiride. This finding significantly strengthens prior evidence (Cools et al. 2007b; Durstewitz and Seamans 2008; Floresco et al. 2006; Mehta et al. 2004; Stelzel et al. 2010) for a role of dopamine D2 receptor signaling in set switching, thus further establishing a role for dopamine outside the domains of working memory and learning in humans. In particular, the data concur with the dual-state theory put forward recently by Durstewitz and Seamans (2008) and Seamans and Yang (2004), which is grounded in in vitro neurophysiology and biophysically realistic computational modeling work (see Introduction). According to this theory, dopamine D2 receptor stimulation favors fast flexible switching between different task-relevant representations, by allowing multiple inputs to impinge simultaneously on the PFC. It also fits with data from animal studies showing that genetic overexpression of striatal dopamine D2 receptors (Kellendonk et al. 2006) and abnormal increases in dopamine D2 receptor activity in the rodent striatum alters set shifting in rodents (Haluk and Floresco 2009). It might be noted that the present finding of a blockade of the beneficial effect of bromocriptine on set switching by pretreatment with sulpiride highlights the role of dopamine D2 receptor signaling in set switching, but does not directly rule out the involvement of dopamine D1 receptor signaling or the importance of synergistic action between dopamine D1 and D2 receptor signaling in set switching. Indeed rodent work suggests that both dopamine D1 and D2 receptor signaling are important for cognitive flexibility (Floresco et al. 2006). The conclusion that set switching implicates dopamine D2, but not D1 receptor signaling would require demonstration that effects of bromocriptine were not blocked by a dopamine D1 receptor antagonist. Unfortunately, there is a relative lack of dopamine D1 selective drugs available for human research, and accordingly, such a demonstration will have to await future developments. An interesting feature of current dual-state theory is that the beneficial effect of dopamine D2 receptor stimulation on set switching might be accompanied by a detrimental effect on the stabilization of current task-relevant representations. This hypothesis is corroborated here by the observation (as well as our prior observation; Cools et al. 2007b) that the drug effect on the switch cost was driven by a combination of better performance on switch trials and poorer performance on repeat trials (Supplementary results: Table S2). Indeed performance on repeat trials would suffer from poor stabilization of task-relevant representations. It also concurs with previous findings in humans that the dopamine D2 receptor antagonist sulpiride impaired performance on task-set switching but, by contrast, improved performance on a delayed response task that required the stabilization of representations in the face of task-irrelevant distraction (Mehta et al. 2004). Unlike this prior study (Mehta et al. 2004), we here failed to uncover a significant task-set switching impairment after administration of sulpiride. This is surprising, not only given that prior finding but also given our observation that sulpiride did block the beneficial effect of bromocriptine on set switching. There are a number of possible explanations for this discrepancy. First, there might have been a difference between the two studies in terms of the time of testing after drug intake. Our set switching data were acquired approximately 4 h after drug intake, while (Mehta et al. 2004) started testing already 90 min after drug intake. Dopamine D2 receptor occupancy after sulpiride administration, measured approximately 2 h after intake, is relatively modest (Mehta et al. 2008). Accordingly, dopamine D2 receptor occupancy after 4 h might have been insufficient to exert an effect on its own, even though it was clearly sufficient to block the effects of bromocriptine. A second possibility is that it is particularly difficult to demonstrate impairment using the present version of the task-set switching paradigm, where subjects were constantly encouraged and motivated to perform as well as they could by means of monetary incentive. Thus, the paradigm might simply not have been sensitive to detecting impairment (as opposed to improvement). In any case, there is one major interpretational advantage of our failure to find an impairment after administration of sulpiride by itself; indeed, this feature of the data implies that the effect of bromocriptine was blocked rather than masked (or averaged out) by an effect of sulpiride, thus strengthening our conclusion that dopamine D2 receptor stimulation is essential for bromocriptine to enhance set switching performance. The baseline-dependent effects of bromocriptine on set switching resemble previously observed effects of bromocriptine on reward learning and working memory (Cools et al. 2007b, 2009). For example, we have previously shown that beneficial effects of bromocriptine on reward learning are greatest in subjects with low dopamine synthesis capacity (Cools et al. 2009). Similarly, we have also shown that beneficial effects of bromocriptine on set switching were restricted to high-impulsive subjects (Cools et al. 2007b), with impulsivity being associated with low baseline dopamine function (Buckholtz et al. 2010; Dalley et al. 2007). One possible mechanism underlying this enhanced beneficial effect of dopamine receptor stimulation in low dopamine subjects is enhanced postsynaptic receptor function. Indeed the dopamine system is highly plastic and regulates itself to maintain equilibrium, partly through changes in transporter and receptor density/function. The DAT1 10R subjects are thought to be characterized by high dopamine transporter density, which is associated with enhanced uptake of dopamine from the synapse and thus reduced remaining levels of dopamine in the synapse. Following the rules of homeostasis, such low synaptic dopamine levels might well be accompanied by increased postsynaptic dopamine receptor function. Increased postsynaptic receptor function would compensate for the reduced synaptic dopamine levels, thus contributing to the maintenance of equilibrium in overall dopamine function. In other words, enhanced receptor function might represent a self-regulatory or compensatory mechanism aimed at maintaining homeostasis, i.e., optimal functioning of the low dopamine system. In this context, the lack of a DAT1 effect on set switching at baseline (under placebo) is not surprising because any dopamine-dependent function including set switching should depend on a combination of synaptic dopamine levels and receptor function. Indeed high- and low-dopamine groups have been observed to perform similarly under placebo in a number of previous studies (Cools et al. 2007b; Kimberg et al. 1997). Critically, this enhanced postsynaptic receptor function might underlie the disproportional response of low dopamine subjects to dopamine receptor stimulation. Thus, the significant effect of dopamine receptor stimulation with bromocriptine in the 10R, but not the 9R group, is not surprising, given these presumed hyper-functioning dopamine receptors. 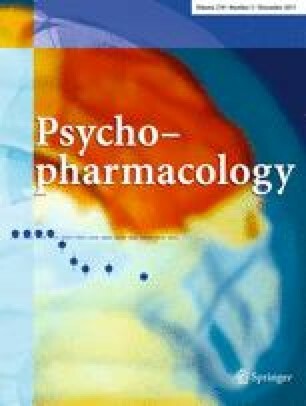 Our finding that bromocriptine did not impair subjects with higher baseline levels of dopamine (i.e., the 9R carriers) was somewhat surprising given prior observations that subjects with already optimized levels of dopamine can be impaired by dopaminergic drug administration (e.g., Cools et al. 2009; although see Cools et al. 2007b). Such detrimental effects of dopaminergic drug administration have been accounted for by inverted U-shaped relationships between dopamine receptor stimulation and cognitive performance, whereby both too much as well as too little dopamine leads to poor performance. Our finding that the 9R carriers were not impaired accordingly might reflect their positioning near, but not quite yet at the optimum of the so-called inverted U-shaped curve (Cools and D’Esposito 2011; Cools and Robbins 2004). However, the obvious alternative hypothesis relates to our failure to obtain an effect of sulpiride; the paradigm might simply not be sensitive to detecting impairment, perhaps due to high levels of incentive motivation induced by the reward cues that preceded each trial. According to this alternative hypothesis, subjects with high basal levels of dopamine will exhibit impairment after bromocriptine on a task that does not involve monetary reward. Set switching has most often been associated with the PFC (Aron et al. 2004; Derrfuss et al. 2005; Monsell 2003; Sakai 2008), and traditionally, cognitive effects of dopamine are ascribed to modulation of the PFC. However, recent theories as well as empirical data have highlighted a complementary role for (dopamine in) the striatum (Braver and Cohen 2000; Cools et al. 2004; Frank et al. 2001; Leber et al. 2008; Lewis et al. 2004; McNab and Klingberg 2008). Specifically, recent computational work has emphasized the role of dopamine in the striatum in the updating of current task-relevant representations (Hazy et al. 2006). The suggestion that the striatum is well suited to serve the gating mechanism that updates current task-relevant representations in the PFC concords with a rapidly growing body of data from functional neuroimaging and animal studies on working memory (Collins et al. 2000; Dahlin et al. 2008; Dodds et al. 2009; Marklund et al. 2009; McNab and Klingberg 2008). Furthermore, it also concurs with empirical data from human imaging and animal studies showing (effects of dopamine D2 receptor manipulations on) striatal involvement during set shifting (Aarts et al. 2010; Clatworthy et al. 2009; Collins et al. 1998; Cools et al. 2003, 2007a; Cools and Robbins 2004; Cools et al. 2007b; Dodds et al. 2008; Floresco and Magyar 2006; Haluk and Floresco 2009; Kellendonk et al. 2006; Leber et al. 2008; Lyon and Robbins 1975; Oades 1985; van Schouwenburg et al. 2010). For example, we have recently shown, using dynamic causal modeling of fMRI data, that activity in the striatum may regulate set switching by modulating (or “gating”) connectivity between the PFC and task-relevant representations in posterior cortex (van Schouwenburg et al. 2010). Moreover, Stelzel et al. (2010) reported decreased flexibility in subjects with increased dopamine D2 receptor densities, an effect that was accompanied by increased PFC activity and increased PFC–striatal coupling (possibly reflecting decreased neural efficiency). Although both the DAT and dopamine D2 receptors are most abundant in the striatum (Camps et al. 1989; Ciliax et al. 1999; Hurd et al. 2001), the improvement of switching in the current study might well have been a combination of drug-induced changes in striatal and PFC activity; we therefore do not rule out the involvement of the PFC in the present study. However, the finding that effects of bromocriptine are DAT and dopamine D2 dependent strongly implicates the striatum. This observation also concurs with previous work with patients with Huntington’s disease (Aron et al. 2003), Parkinson’s disease (Cools et al. 2001a, b), and focal basal ganglia lesions (Cools et al. 2006). In sum, our findings strengthen evidence in favor of the hypothesis that dopamine D2 receptor signaling is important for set switching, with prior evidence suggesting that this effect is mediated by the striatum. The data also illustrate the need to take into account genetic variation in baseline levels of striatal dopamine when predicting drug effects. Finally, although the sample size was rather small, this study emphasizes the value of employing the pretreatment approach in humans and future studies might adopt this approach to enable replication and extension of the present results. This study was supported by a Vidi Grant to RC from the Innovational Research Incentives Scheme of the Netherlands Organisation for Scientific Research. We thank the Chemical Endocrinology Department at the Radboud University Nijmegen, especially Fred Sweep and Rob van den Berg, for analyzing the blood samples. We thank Angelien Heister for molecular genetics work.